Year after year-end, we look backward to the past whole year just to most often than not, realize that we have not gained spiritual growth, no positive changes or we are far from realizing what we wanted to achieve. All this is because we fail to include the key player who is also the Master Planner of our future. Where God’s presence is missing, chaos and disorderliness will surface. However, our God is not a God of disorder such that everything will only be in order if we plan and organize our borrowed life, the biblical way. Paul wanted to address their disorderliness in worship because it was causing confusion among them. He reminded the congregation that our God is not the God of disorder. Although this was written to the believers in Corinth, it is also useful in correcting us at this present time both as a church and as individuals (2 Timothy 3:16-17). When it comes to starting our plan with prayers, we can follow Nehemiah’s great example. Upon learning that the surviving Jews from the Babylonian captivity were in great distress and that the walls of Jerusalem were also in ruins, Nehemiah wept and mourned for many days. He fasted and prayed before the God of heaven, recognizing his sins and the sins of Israel and asked for God’s guidance in his determination to rebuild the walls of Jerusalem (Nehemiah 1:1-4). Each morning is the start of something new, something fresh. That is why we should start every day and every chapter of our life with a prayer, asking God to carry out His perfect will in all our thoughts and plans. Our prayer shall be for God’s guidance and direction in always seeking the truth in Him that we may take the right path because if God is with us, we can never be lost (Psalm 25:4-5; Psalm 32:8). We do not believe in fate or fortune-telling. We’d rather ask for God’s instructions and put our trust in Him. Unlike a horse with a horse bit that is pulled in any direction by someone in control, Christians must pray for God’s perfect will. I believe that every Christian knows how to pray and ask for God’s guidance. But do we know how to listen? I mean really listen. Hearing is different from listening. When we say we “listen” to what someone is saying, it means we “obey” that very thing that is said to us. 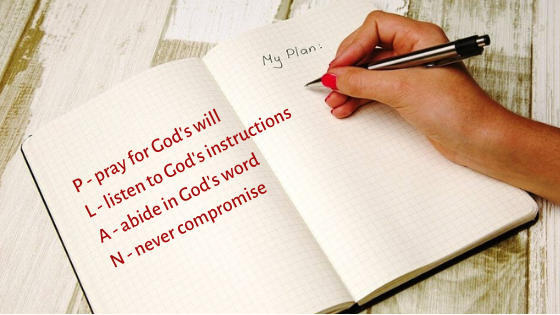 Listening to God’s instructions is as equally important as praying for His directions because those who listen to instruction will prosper (Proverbs 16:20 NIV). But what does it mean for us to prosper when we listen and obey? To “prosper” does not only mean to achieve economic success; it also means to succeed. The Bible gives us several examples of great people who listened and had the heart to obey God’s instructions and prospered. Abraham obeyed God’s command to go out of his country into a place where He will show him and prospered (Genesis 12:1-4). Noah obeyed God’s instruction to build a massive boat, making him the laughingstock of his community and was saved from the flood, along with his entire family and a pair of each kind of today’s living creatures (Genesis 6:13-20). Moses obeyed God and led the Israelites in crossing the Red Sea on dry ground (Exodus 14:1-22). King Solomon knew nothing about ruling a nation when he succeeded his father David as king at the age of 20. But when God visited him in a dream one night and asked him whatever he wanted, instead of asking for wealth and honor, Solomon asked for a discerning heart (wisdom) to govern the nation of Israel and to distinguish between right and wrong. God was pleased that He also gave these to him in addition to what he asked for (1 Kings 3:5-9). Just like them and many others, we should learn not only to listen but to have an obedient heart. And as God’s sheep, we must be sensitive to His voice and follow His instructions (John 10:27). God, who is our good Shepherd, knows each of us very well and He is always there to guide us if we only know how to listen and obey Him. Without God, all our efforts amount to nothing. Everything we plan and everything we desire will just go down the drain. But if we truly abide in Him and He abides in us (John 15:7), then we are transformed into a new creature with a changed heart and a renewed spirit. This spirit will cause our desires to be in line with God’s will so that whatever we ask for shall be done by our heavenly Father. Joshua 1:8 exhorts us to meditate on God’s Word day and night and we will become prosperous and successful. To meditate continuously is to always tune in to God and soak our spirit in His words. If indeed we have Christ living in us, we ought to live Christ-like lives, not just momentarily or temporarily, but continuously until the end (Colossians 2:6; 1 John 2:6). Are you abiding in Him? A. To compromise means to live like the world does (Romans 12:2). How do you know you are not compromising? If what you believe and stand for are opposed to the “norm” and what’s acceptable to the people in the world. We are to abandon the chase for pleasures, status or possessions and stop living like everyone else. God is good and His will is always pleasing and perfect. Nothing impure is acceptable to Him that is why we are to offer our bodies as a living sacrifice to God. We must let go of our old outward behavior and start acting in a way that is pleasing to God as a result of a transformed mindset; one that is possible only when we are totally surrendered to Him. When the mind and behavior are changed, the perfect will of God in us is completed. Our desires will no longer be based on earthly motives but on heavenly goals. Being aligned with God’s perfect will, we will develop a heavenly mindset that is centered on seeking first His kingdom in our lives (Matthew 6:33). As new creatures in Christ, we no longer follow the desires of our flesh listed in Galatians 5:19-21. Instead, the fruit of the Holy Spirit will start to manifest in our lives. Does this mean we will no longer have selfish desires? No! But the Holy Spirit will enable us to live righteous lives if we let Him. B. To compromise means not doing what we know is right. This is called the “sin of omission” (James 4:17). Knowing what is good and yet failing to do it makes us guilty of the sin of omission. When James wrote this, he knew that it is far easier to think and talk about dependence on God than it is to live it. Yet he made it plain that if we know these things, we are accountable to do them. As Christians, we have already been brought into the light and in the knowledge of God’s truth so there are no excuses. Jesus makes the same point in Luke 12:41-48 when He told the story of servants and how they obeyed their master in his absence. Jesus concluded the story with this application: “From everyone who has been given much, much will be demanded; and from the one who has been entrusted with much, much more will be asked” (Luke 12:48). We are confident that as long as God is with us and provides our agendas, we will have boundless hope and will reach His promised future. God will see us through to a glorious conclusion, no matter the hardships, suffering, and trials we would have to experience for God to fulfill His will in our lives. Great attitude there. It really touched me deeply. I always find your articles useful most times because it always touch some particular areas of my life that I can’t share with no one while I look for the solution in secret. In this article article, there is a certain area that I have a question to ask on Listen to God’s Instructions. Can I be able to hear God’s instructions when He speaks to me when I don’t say my prayer every morning due to the nature of my work? Thanks. I am grateful you find the articles useful to you. There are also good articles written by the Admin of this website and other respected contributor that you will find inspiring and useful. God is faithful and always there to reach out despite our busy schedule. The fact that what you find answers in some of the articles you read shows that God in this simple way talks to you. The more you will come to hear His instructions, if only you come to Him in constant prayer. The scripture says prayer answereth all things; and also our ability to run away from sins matters a lot. Our God is a God of holiness and He is pure. Yes, I do agree that we do need to pray as much as we can to be aligned with God’s will in our lives. Our God is sovereign over things and He holds our future. There will be no better assurance than putting our trust and faith in Him. Thank you for taking time to read and may you find time to read future postings, as well. God bless you more! What is the Cost of Our Salvation?